Shinewhitebox is well known platform for development of applications that can assist end users with stunning video recording results directly from Mac devices. Some of their most useful and easy to use products are iShowU Instant and iShowU Studio. Both of these software programs are designed with user friendly interface and offer incredible features for video editing. iShowU Instant:This is a advanced real time screen recorder tool with lots of easy to access features, impressive presets, super fast type of capture engine, timers, audio filters, time lapse support and retina support abilities. You can buy this product with payment of $24 only whereas the standard plus advanced package is priced at $58 only. iShowU Studio:It is an effortless full screen type capture tool that can assist users in text editing, annotations, GIP generation, transitions and highlight management. Some of the best features included in this tool are slick editing interface, stunning zoom/pan options, keyboard supported animations, mouse highlighting, iOS Device recording, camera capture abilities, app & mic audio capture and screen recording. The standard software package is available with price tag of $79 only. It offers so many highly useful tools such as compressor, audio processor and audio adjust equalizer. The timer feature is rated as most important addition to its editing platform. This platform is interactive, simple and extremely easy to use. You can easily share all videos after editing and recording task. Time lapse videos can be easily recorded. It is possible to record audios from almost all popular devices as it supports multichannel audio input. Videos are updated instantly; it will never lead to time wastage. You can enjoy recording up to 1080p resolution level. It is possible to freeze frames anytime for any desired time duration. You will not b able to find enough resources or tutorials about this software over internet so you need to make all efforts yourself to learn how to use it. The offered editing feature is very basic as advanced features are not covered with standard pricing plan. Many other competing platforms are offering better features with cheaper price range. It can be used by Mac users only. This software tool can be accessed by Mac as well as Window users with payment of $ 59.99 only. Filmora is well known for its impressive features that make editing process much easier for beginners. It is possible to access screen recording feature with free version and the best thing to know is that it will not pose any watermark on your end results. Filmora never restricts its users with video recording time limits; even free version also offers unlimited recording time. It includes so many advanced fashion templates as well as other resources and new ones are updated every month. You will be able to access its free update for lifetime, so works like a onetime investment for all your video editing needs. The editing features are very easy to use. You will definitely appreciate their awesome customer support service. It is much easier to access so many tutorials as a beginner on internet. ScreenFlow is designed especially for Mac users and you need to make payment of $99 to gain access to its fully features platform. It is a professional kind of software program with all advanced video editing features so that people can develop stunning videos for their channels. The editing feature is highly powerful; it will create mesmerizing results even with minimum editing efforts. It is well known for professional video editing needs. Screenflow is not rated to be as useful as other competing free software platforms. You will not be able to avail any free upgrade. You need to make a huge investment out of your budget to get this classic software tool for your video editing needs. It requires payment of $199 and you can avail access of Camtasia on Mac as well as Window platforms. This software is highly stable and you will find its interface much simpler as compared to other competitors. It can meet all advanced recording and editing requirements of professionals. It is much easier to transfer files between two platforms- Mac and PC using Camtasia. The resource style is designed specifically for business platforms, it is not fashionable enough. 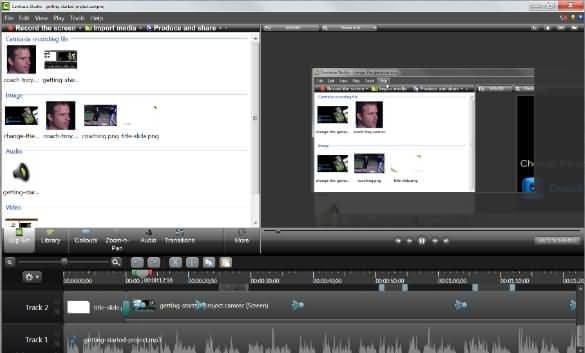 Camtasia is one of the highly priced video editing software tools that never even offers any free upgrade. It demands a high performance type PC or Mac device.